1 Jesus spoke these words, lifted up His eyes to heaven, and said: “Father, the hour has come. Glorify Your Son, that Your Son also may glorify You, 2 as You have given Him authority over all flesh, that He should[a] give eternal life to as many as You have given Him. 3 And this is eternal life, that they may know You, the only true God, and Jesus Christ whom You have sent. 4 I have glorified You on the earth. I have finished the work which You have given Me to do. 5 And now, O Father, glorify Me together with Yourself, with the glory which I had with You before the world was. 9 “I pray for them. I do not pray for the world but for those whom You have given Me, for they are Yours. 10 And all Mine are Yours, and Yours are Mine, and I am glorified in them. 11 Now I am no longer in the world, but these are in the world, and I come to You. Holy Father, keep through Your name those whom You have given Me,[b] that they may be one as We are. 12 While I was with them in the world,[c] I kept them in Your name. Those whom You gave Me I have kept;[d] and none of them is lost except the son of perdition, that the Scripture might be fulfilled. 13 But now I come to You, and these things I speak in the world, that they may have My joy fulfilled in themselves. 14 I have given them Your word; and the world has hated them because they are not of the world, just as I am not of the world. 15 I do not pray that You should take them out of the world, but that You should keep them from the evil one. 16 They are not of the world, just as I am not of the world. 17 Sanctify them by Your truth. Your word is truth. 18 As You sent Me into the world, I also have sent them into the world. 19 And for their sakes I sanctify Myself, that they also may be sanctified by the truth. Jesus Christ whom You have sent. God gives glory, authority, work, people, and wisdom to Jesus. God sanctifies and protects us. God commissions Jesus to go out into the world. He does all this from the motivation of love. God so loved the world, He gave His only begotten Son that whoever believes in Him should not perish but have everlasting life (John 3:16 NKJV). Start thinking about all God has done for us today. Lord God Almighty, blessed be your name. You are wonderfully generous, graciously loving and forever kind to us because of your Son, Jesus. Thank you for loving us as you love Him. In Jesus’ name we pray, Amen. I have finished the work. I kept them in Your name. Jesus came to glorify God by finishing His work and manifesting God to men. I gave us God’s word, kept us in God’s name and sent us out into the world to tell others. He gave us the same glory God gave Him and He declared God’s name to us. What a blessing to finish our life with the same gusto! To know we finished the work God gave us, of manifesting Christ to men and sharing God’s promises with others. Lord Jesus, thank you for your faithfulness to complete the work God gave you. May we be filled with the same determination and complete our calling in this life. In your precious name we pray. Amen. What we allow our mind to think about eventually plays out in our life. Let me give you two examples: When I focus on all that is not right or doesn’t fit with my plans, I turn into a disgruntled person. Blaming others, pointing out flaws, and complaining about everything become normal actions. But when I focus on all God has done for me, how He saved me from hell, restored my marriage, and renewed my heart, I turn into a humble, grateful, and pleasant person. Joy fills the heart and mind. Thoughts lead to action. Therefore contentment begins in the mind. Renewing our mind is a daily challenge. One must be diligent in providing a constant stream of good, right, and pure thoughts. Jeremiah tells us “the heart is desperately wicked. Who can know what?” Jesus tells us “out of the heart springs forth the issues of life”. Where do the good, right, and pure thoughts come from? Not from us. God’s word is the only source of good, right, and pure war thoughts. God’s thoughts are higher than ours. His ways are better than ours. Romans 12:2 says to be transformed by the renewing at our mind so we will know the good, acceptable and perfect will of God. Paul urges us in Philippians 4:8 to meditate on what is true, noble, just, pure, lovely, of good report, virtuous, and praise worthy. If our thoughts are fixed on God’s word then complaining, comparing, envy, strife, and self-centered thinking will disappear. In other places and Scripture we are told to do all things without complaining and disputing. And again were told in everything work as though we are working for the Lord rather than mere men. With our minds firmly rooted in God’s word these things become easier to do. Read the Bible daily, even if it’s just a verse or two. I think about the verse you just read. Try to remember it throughout the day. Write the verse down, carry it with you, and stick it where you will see it several times a day. Share the first with someone else. The more we interact with God’s word for more insight He reveals to us. What are you doing today to get God’s word rooted deeply in your mind? Dear God, thank you for giving us your truth your word and a life with you. Give us that desire to draw close to you because your work tells us when we do you will draw near to us. In Jesus name we pray these things Amen. Jesus used this phrase many times as He taught His disciples. Let’s take a look at several of them from John 13 through John 16. We are His servants if we believe in Him. We are already clean because the word He spoke to us. His joy remains in us so our joy will be full. We will not stumble when we remember what He told us. Though we may sorrow at times, it will turn to joy in the end. We are to ask anything in Jesus’ name and God will give it to us. The result is peace. How beautiful Jesus’ Words are! May you cherish them and let them dwell richly inside of you. God’s Word is a lamp to our feet and light to our path, so let’s stick to the path! Jesus, thank you, for your love and guidance. Enable us to desire your word. We draw near to you this day. Please draw near to us. In your precious name we pray. Amen. Contrasting darkness and light we come across some interesting insights. While darkness is shapeless, colorless, fear filled, and hopeless, light brings clarity, purposefulness, and activity. Think more about darkness. We can’t really see anything. Therefore we don’t know where we are or where we’re going. We might stumble around bumping into things and hurting ourselves. If we can’t see a hand before our face how can we possibly accomplish anything? Darkness seems cold, black, and uninviting. It is a place where nothing gets done. Now let’s think about light. It is bright, colorful, warm, and inviting. Light brings clarity so that we can see what we’re doing and where we are going. There is no fumbling around and we can avoid trouble. We can do things in the light such says reading a book, writing a letter, and meeting the needs of others. Light is joyful and purposeful. There’s lots of activity in the light. The world was in darkness until God made light. In the darkness of our mother’s womb we all began. In the darkness of our mind, sin entered the scene. Poisoned by self-centered thinking, we made to hurtful decisions to rebel against our Creator. Jesus calls us to believe in the light that we may become sons and daughters of the light. We are permitted to trade in our guilt and shame for a new life simply by trusting in Jesus. We are brought into the family of God sealed with the Holy Spirit as a guarantee by coming to the light. Which will you choose darkness or light? Lord Jesus, thank you for coming into the world as a light for us to follow and believe in. Thank you for saving us from eternal darkness. Help us this day to choose light and live with you forever. In your name we pray Amen. 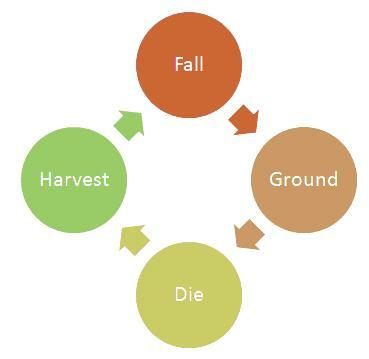 What happens at the end of the growing season? The harvest comes, but it wouldn’t be possible if not for the grain. It did its part by dying to produce a crop. The field is re-plowed, reseeded with grain, and the growing process starts again. Just as the field must be replanted season after season, our process must repeat itself over and over again until we enter heaven. John 12:25 says “He who loves his life will lose it, and he who hates his life in this world will keep it for eternal life.” The love his life part speaks of the self-centered life, controlled by “what’s in it for me” mentality. Jesus said those living this way will ultimately lose everything. Conversely, anyone who hates his life will keep it for all eternity. What do we do when we hate something? We throw it away, distance ourselves from it, and try not to think about it, right? Jesus is telling us to tease the same. Distance us from our self, become others-focused instead. In this way, we give our life away. The reward for doing so is clear; life forever with Jesus. Which part of this process is most difficult for you? Why do you think that is? Ask a trusted friend to help you recognize pride, keep you accountable in confessing, and to remind you of the benefits of living life God’s way. John 12:26 says “If anyone serves Me, let him follow Me; and where I am, there My servant will be also. If anyone serves Me, him My Father will honor.” When we follow Jesus, we will act as He did. We become servant-hearted, as He is. So begins our journey. Lord Jesus thank you for the many stories do you used to teach us your way. Help us be like the grain, willing to fall to the ground, willing to die, says a harvest will be plentiful. 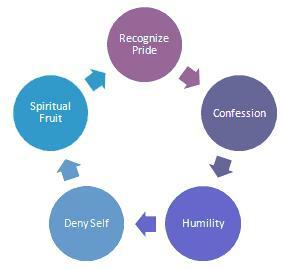 Help us recognize pride, confessed that it, deny our self, that the fruit of the Spirit might be evident in our lives. Not by our power, but by your spirit we pray these things in your name amen. Have you ever considered Acts 17:6 speaking about how the followers of Jesus were turning the world upside down? Figure 1 below describes this paradox between the world’s way and God’s way. The Jews who were not persuaded by the disciple’s teachings were right about their claim. The disciples did turn the world upside down. The Jews were on the bottom side of the stairs, following the world’s way. Along came the disciples living by Jesus’ way traveling up the stairs on the top side. When we compare the two paths it appears they are opposite of each other. Consequently, one side will feel upside down. 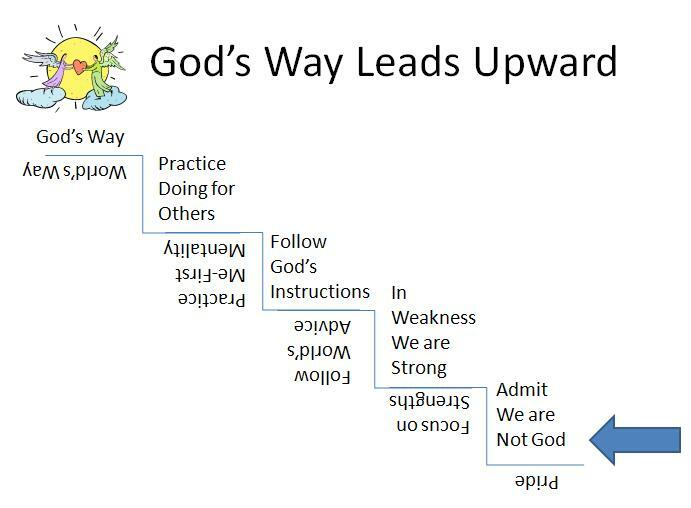 Follow the steps leading up to God’s way, for these are the steps to a content life. Lord Jesus, thank you for choosing the foolish things to be the path to you. Enable us to choose the right side of the stair case leading to God’s Way. Every time we are tempted to follow the world’s way, may we remember to do the opposite instead. In your name we pray. Amen. Contentment is such a pleasant sounding word. It conjures pictures of green meadows, trickling stream, peacefulness, and calm serenity. Contentment is a place where all your needs are cared for. It sounds like fantasy doesn’t it? Is this for real? I’m here to tell you “yes, contentment is real and it’s possible”. The apostle Paul talked about this contentment in Philippians 4:10-12 when he said “have learned in whatever state I am, to be content”. I know this place exists, for I myself have been there from time to time. Contentment is a reward for losing my life to God. Look at 1 Timothy 6:6 NKJV “Now godliness with contentment is great gain.” I don’t mean we ran out and commit suicide. Rather I’m referring to a wholehearted commitment to living God’s way. We learn to give Him everything because He gave His everything that we might live. How do we get to this place called the contentment? The directions are easy but the journey may be challenging. Contentment comes from God. Therefore the path to contentment always begins with drawing closer to God. There are many ways to get closer to God: read the Bible, pray, fellowship with other believers, worship, go to church, serve others and on and on. What you choose is up to you. Our part is to seek God. God’s part is to guide us. And He is faithful to do just that. Next we begin trusting God. Start by giving to God something bothering you and then watch how He takes care of it. Keep a journal of how God answered your prayers because referring back to all God has done will help us trust him more. Lastly we act based on our trust in God. What does this look like? This will be different from person to person. God has shaped each one of us differently. Therefore the action we take will depend on which gifts, talents, abilities, life experiences, and personality God’s given us. When we start using all we have been given we not only glorify and honor God but also demonstrate our trust in him. Lord Jesus, in you we find contentment. Thank you for it your healing touch, forgiveness of sins and the power to live for God honoring life. Draw us closer so we may experience your contentment stay and every day. In your name we pray amen. You have no doubt heard the saying “opposites attract”, but I doubt you have heard it in this context before. Throughout the New Testament we are taught by Jesus and his disciples to live differently. When we do these things, it is opposite from what our culture and the people around us we do. Being different, we stand now like a city on a hill. We shine like a light that can’t be easily snuffed out. The more consistently we follow Christ and his examples, the more others are drawn to us to find out why. Then it’s our job to give them an answer for why we live as we do. Jesus is compelling not just for His name but for His actions. He followed the will of His Father. He was obedient and even unto death. He served others rather than waiting to be served. He healed people. He gave His life so we could live. Likewise Christians ought to be compelling not for their namesake but for their actions done out of love for their mighty Savior. Lord Jesus thank you for having a plan and inviting us to be part of that plan. Help us to live our lives pleasing to you. Enable us through our witness to the world to stand out for you, to be opposite of the world, to turn the world upside down for you Lord. In your precious name we pray Amen. Many Jews started believing in Jesus when they witnessed Lazarus being raised from the dead. Each one of us is like Lazarus. We were raised from the dead as soon as we believed in Jesus Christ. Following Christ has its cost. Look at verse 10. The chief priests wanted to kill Lazarus as well as Jesus simply because so many Jews started believing in Jesus because of him. Our story of salvation will have an impact on others. Some may turn to the Lord and believe. Others may treat us rudely, shun us or try to slander our faith. While we have no control over how others will react, we do have a responsibility to share our story when someone asks about it. · What were you like before? · How are you different now? · And what caused the change? I used to be a perfectionist judging others by my insanely high standards. On the verge of divorce, I found myself humbled by the consequences of my behavior. I cried out to Jesus and asked him to come into my life. Now I no longer judge others and have found contentment and peace through faith in Jesus. Do not be afraid to share your story with others. For the Bible teaches we are blessed when we do. We are called to be salt and light to the world around us. Therefore, as Matthew 5:16 says “Let your light so shine before men, that they may see your good works and glorify your Father in heaven”, let’s shine! Lord Jesus, thank you for making all things work together for good. Thank you for the good work you do in us will be noticed by others. Give us courage to share our story when we are asked, regardless of how others may respond. In your name we pray amen.